The 1970s are considered to be the Silver Age of American Cinema. A list of movie releases from that decade reads like an AFI 100 list. The French Connection, A Clockwork Orange, Taxi Driver, All The President's Men, Network, Rocky, The Exorcist, The Omen, Halloween, Jaws, Star Wars, Close Encounters of the Third Kind, Superman, The Deer Hunter, Apocalypse Now, and Raging Bull were all released in that fabled era of moviemaking. The era is one of firsts: Jaws gave us the world's first blockbuster, The Exorcist proved that the horror genre was not just for teens, and Superman showed us that a man can fly. Of all the decade's achievements, The Godfather would prove, time and time again, to be the period's definitive film. What does it mean to be a "definitive film"? If you had to choose one movie to represent a location, a people, a time period, or a particular genre, what would it be? Many consider Star Wars to be the definitive space opera. It spans generations in its scope and covers themes universal to all mankind. It also bridges the gap between "serial B-movie kid's show" and a science fiction classic with its technological breakthroughs in filmmaking. In Hollywood, presentation is just as important as substance. Pulp Fiction is a generation defining movie with its judicious use of a Rock 'n Roll soundtrack, retro fashion sense, and use of heroin. That movie did more to bring back H and to nail the coffin on cocaine more than any other of its time. And, for years after its premier, kids all over the world were rolling their own cigarettes. The Godfather movies were not too far from the Pulp Fiction mold. It captured the imaginations of people around the world with its honest portrayal of family, honor, and love juxtaposed with greed and paranoia. It hit home with Americans because of its candid look at an immigrant success story. In a way, the Corleone family represents any society in human history that had established itself and then fought for its very existence. Parts I and II were released in 1972 and 1974 respectively. In 1976 America would celebrate its bicentennial. 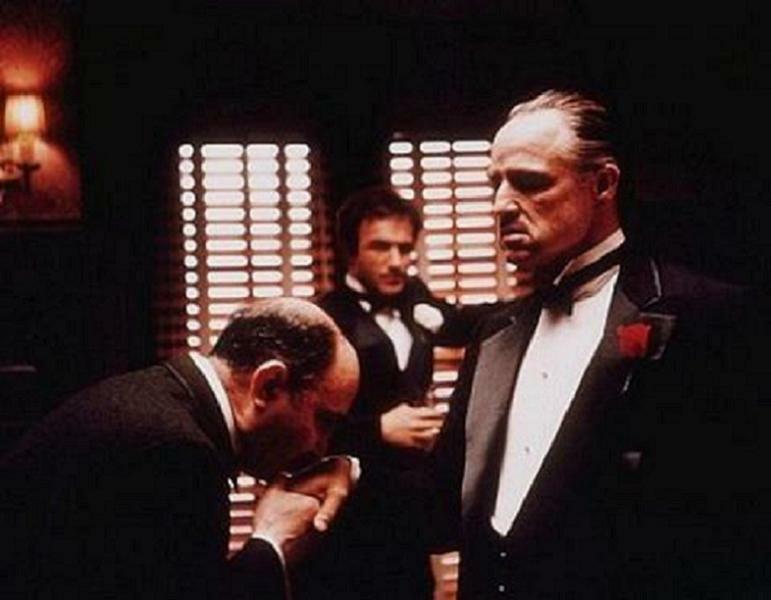 The power of The Godfather movies on the American psyche would be a defining moment. When Marlon Brando says, "I'll make him an offer he can't refuse," an already legendary actor rose to the heights of immortality. The image of him in a tuxedo seated behind a large mahogany desk with a pet cat on his lap is THE image of a mafia don. What's also interesting is the imagery of people supplicating before him. These are people who, by the laws of civilized society, cannot be helped, so they turn to the only person that can possibly aid them in their time of need. It's the very image of American hegemony on the world stage. There were other notable performances by Al Pacino, Diane Keaton, and Robert Duvall but Robert De Niro was a marvel as the young Vito Corleone. When you have an actor's director like Francis Ford Coppola directing such a retinue of superlative actors, you're bound to win a few awards. But the unsung hero of these films has to be the cinematography. It single-handedly brought back the 3-point lighting technique first introduced by Renaissance painters like Rembrandt. This kind of lighting technique uses shadows to bring out the light on subjects. Not only is it visually interesting but it conveys the visual subtext of the battle between light and shadow within the characters with a subtlety not found in many modern movies. Francis Ford Coppola oversaw a recent restoration of the original prints of the films. I saw them at the Arclight Theater in Hollywood. I had a nerdgasm. Go buy the new DVDs. Now.